As the dirty war against the Venezuelan people unfolds at a swift and ruthless pace, the best accounts and analysis are not available in English. The report below is an example of critical information that we need today. I am confident that readers can both understand what is said and make allowances for the fact this is run through a translator. They say to be there, in the line of contact, risking the skin, fighting against so many adverse factors in a moment of adrenaline and high tension. You see them attending to the victims, you see when they say that they act disinterestedly, mystically, a question of vocation, of trade, and by custom the “noblest of all”: to guard life, health. Something universal. They say that they were born in adversity, they impact, they move their people. They exalt feelings (without frontiers), stand on the side of the weak, assist them. But they would also come to the fort if they needed it, they say. They are untiring. They are gaining the applause of all. They receive centimetraje in the means. The awards and recognitions await in the near future. They become untouchable, sacred, angelic. Thus, without fault in the story, a squad of rescuers, doctors, medical students, but above all uuu-niversitarios: the “white / green cross helmets” emerge without fault, inserting themselves within the Venezuelan and international informative landscape, Of the current political context. And the strong advertising campaign that promotes them will be anything but innocent. It contains all the symbolic elements, places all the necessary signs and stimulating data that draw a “noblisima” cause. But the adage says: if it is a story, it sells. We think of images, emotions and stimuli in the first place; Then the brain shapes it in its rational scheme. And not the other way around. That is the tactic with which a product is placed in the market. Apart from precipitating a priori judgments about the composition of the rescue group, which has become one of the central protagonists in the insurrectional actions of the coup plot, and assuming in advance that the same operative principle is reproduced in which many people Are incorporated and stimulated by what they conceive as nobility or goodwill, just as many people are lumpy in mobilizations whose main operators act with a different and different political intention. And, in the context of the new information landscape that has developed in the actions of the last month, other signs and data seem to guide everything in another direction. “We have no political color, the medicine has no color and we are there to care for whoever is injured, because that is what the Hippocratic oath tells us, we are to care for whoever needs us,” said Daniella Liendo, for all Practical effects spokesman of the group, in an interview with Panampost , signed by Sabrina Martín. “The first aid brigade UCV was born at the time of the protests for ‘La Salida’ in 2014, and revived on Tuesday April 4, when the opposition called the first mobilization after knowing the sentences of the Supreme Court of Justice Which officially annulled the competencies of the National Assembly, already caught up in fact, “Liendo says this time for a work with a clear profile of publicity for El Encouragement, in this case signed by Maria Emilia Jorge M.
Organized from another similar political operation, “The Exit” of 2014, can already be circumscribing the sphere of political and ideological identity. A context. “It is not the same to take care of an injured person in an emergency of a hospital that to attend to him in these manifestations in which we are basically in a war”, maintains Liendo in Panampost, with such turn of nut. The works reviewed for this research coincide in the same “interpretative” traits: youth, freshness, presumed spontaneity, disinterested virtuosity, and unselfish courage. This (deliberately) generalized impression also contributes the projection that they have been having in social networks. Bring in reputed figures for their experience in putting together dirty information operations, such as Braulio Jatar , the well-known astróloga and web star Venezuelan-Mayamera Mía Astral, or the new 2.0 organizations of the trendiest, such as the Facebook account Trending Tropic . In what is accused, too, an accusatory, elaborate work. More professional than usual. In the image above, consecrated visually by Donaldo Barros, one of the influencers “of weight.” The image below speaks for itself. “Before they were 100 chamos who always stayed at the moment of repression, now they are the same 100 chamos, plus the student movement, the leaders of the opposition and the civil society. The departure of a political party of power, now the motives are different: we need people to stop starving, to get medicines to the country, people ask for social change, Liendo analyzes, “according to the note from El Encímulo. Another disinformation, mystifying element, if you will, is in the number of activists who are assumed part of the grouping. The Stimulus (April 11) talks about 21 volunteers. Panampost, whose work is also on the same date (April 11), already speaks of “more than 50”. Effect Cocuyo puts them in “more than 80” on April 17 . Reuters, replicated by La Patilla , already speaks of 120 for April 26, the same as the portal France 24 (in English). Both reports offer more than a coincidence: in addition to the voluntary figure, the respective reports come out the same day, with a very similar description of situation, between chaos and “objective” glorification. Between the chaos and the violence, “the Green Cross arrived”, narrates the report of France24, signed by Esteban Rojas. “When a group of them walks through a protest, protesters stop their cries of ‘No more dictatorship!’ And they begin to cheer them up with cheers and cheers from ‘heroes!’ “Describes Alexandra Ulmer’s work for Reuters. “The affection and warmth shown by Venezuelans is what gives us strength to continue,” sentence, prefabricated and swallowed Rojas, in France24. Common places, television glorification, political candor, alleged superior intentions that reinforce the “objective” character of the “Venezuelan crisis” and of “peaceful protests.” Epic consolidation attempt. Not inconspicuous, but rather delicate inconsistencies, which could be assumed as traces of tender premature labor (or bad confessional praxis): “They began to save lives even before they had a license to practice medicine in a care center, and without But they have been formed to do it well “( The Stimulus ). Detailing, in addition, the incorporation of volunteers of the school of odontology of the University Santa Maria (?). “In the western state of Táchira, bordering Colombia, doctors wear civilian clothing and use pseudonyms to avoid being arrested or attacked by government officials,” notes Reuters’ work, adding a more delicate element in many ways. They are, as will be seen below, an expression “of the vanguard” of the “humanitarian channel” that Luis Almagro has obsessively advocated from the OAS and the National Assembly in contempt. The group’s Instagram account was activated on April 7th . In recent days (this note was published on May 2), in the account of the same network was added the option to receive financing via Amazon and other financing platforms 2.0 style crowd funding . For this, they had to add in their offer to be identified as a company the identification as Medical Company / Medical Company, according to the filter through which their account is visited. War is also a matter of marketing. And if one of the rules of marketing is to impact, it is not a good idea that in the first failed attempts at advertising (the image was removed from your account), it might be more effective to place the gas mask on the older lady instead of the sacrificial Rescuer And do not do it on the stairs of the San Ignacio Shopping Center. All the works consulted also show the same closure and the general “humanitarian” conclusion: “To return to have inventory, First Aid UCV made this Tuesday a collection of supplies and medicines in the church Our Lady of Guadalupe, in Las Mercedes, Caracas; But also have points of collection in Miami, Houston, Washington DC and New York, the United States, Panama City, Panama, Madrid and Barcelona, Spain, Bogotá, Colombia, and Lima, Peru “(El Encímulo). Small de facto channels, micro “humanitarian channels” via “direct diplomacy” and “solidarity action”. But everything remains surface. Behind the veil, the details speak more clearly. Daniella Liendo is a member of the student center of the Medical School of the Central University of Venezuela (UCV). It is also part of the NGO ” Doctors for Health “, a very active lobby in the accumulation (under what criteria?) Of figures, data and elements around the construction of the matrix of humanitarian crisis, lack of medicines (Product of “model failure”). The political connection always ends up revealing the usual suspects. Behind all these formations is Deputy José Manuel Olivares (Vargas, Primero Justicia), president of the Health Sub-Commission and principal promoter of the ” Special Law to address the humanitarian crisis in health “, reverted by the Supreme Court of Justice (TSJ), for its regressive character and its obvious opening of floodgates towards “humanitarian intervention”. Or for example 17: “The rejection of International Humanitarian Aid, requires in any case the previous authorization by the National Assembly, for which the National Executive must communicate to the legislative body the reasons why it intends to reject International Assistance Humanitarian. Transfer of powers of last word that corresponds to other powers of the State, “soft” suppression of sovereignty, opening of a “humanitarian front” that would hardly deal with the transfer of medicines or medical equipment, but as a point of circulation of logistics equipment, Military, intelligence operators, etc. Oenegización of the society, dissolution of political borders of the nation-state (Libya, once again). How many humanitarian interventions did Kosovo have in 1998? How much round of sanctions for the same purpose does this seemingly legal certification offer? How much is guaranteed by international law? From this perspective, and on the syntax in exercise in the immediate reality, in spite of those who participate under the innocent bait of voluntarism (and not of those who obviously fulfill another mission), it is another front of money laundering that has much To do with information war and little with genuine concerns. Cruz Verde, as you may recall, is also a well-known brand of cleaning products. The irony appears alone. The operation against Venezuela is regional, geopolitical, global. The same thing, we have insisted to the point of being tired from this rostrum. The methods by which contexts and ways to orientate the situation towards “regime change”, the undermining of the social, the resumption of political control that consolidates the financial economy and force the planet’s hot spots towards the expected objectives . Thus, it is inevitable to bring in this point the Syrian case, and within that, to the already renamed “White Helmets”. These multipurpose operators that only act in territories controlled by the jihadist entities, which have carried out more than one false file and with a clear anti-State orientation, its integral defense and its way of representing. Its dubious “humanitarian work”, in the foreground, is inserted and strengthened from the logic of spectacle and the usual perceptual banalization of the transmission belt of corporate media interested in the overthrow of the government chaired by Bashar Al-Assad, Which then comes with the same logic of realignment and geopolitical subordination to Western interests. As it is known, they were created by a former British intelligence officer, have been recognized, supported and promoted by how much prize is in the talk of opinion, while receiving moral certification by figures of Western politics and global celebrity. The same ones that today are filing batteries against Venezuela, under similar method. In the immediate past, the “White Helmets” were the main source for the “Syrian government” chemical attack on Jan Sheyjun’s population, which led to direct US intervention by the Trump Administration , By bombarding with Tomahawlk missiles at the Sharyat airbase. His dubious “humanitarian work”, on the other hand, has been dissected by a considerable batch of serious investigations, revealing the publicity construct and shedding light on its true nature, purpose, and membership in the humanitarian industrial complex that complements and whitens the actions Pure and hard political intervention. The “White Helmets” or Syrian Civil Defense is a complex network of public relations firms, such as the renowned Purpose, heavy investments, dark figures from the oil world (including the Rockefeller Foundation) and the Syrian “exile” . It was partially created by the Office of Transitional Initiatives of USAID (with a first donation of $ 23 million among other donations), has received training from MI6 – the British Foreign Intelligence Service -, is financed by the taxes of the citizen gringos And English. Within this media advertising brokerage, as a high-level “simultaneous news placement” in various media, taxed (or taxed) other global action operations, such as the one led by the Avaaz portal, responsible for gathering signatures that requested An “Air Exclusion Zone” over Syria (ie direct and heavy military intervention), which led to its heightened evidence in the huge campaign against the liberation of Aleppo at the end of 2016. This last operation Others resound in the “meeting of signatures” against the Ombudsman, Tarek William Saab. In the same way, they act as a non-state actor that assigns state tasks in the area of assistance and rescatismo, since, for example, the Syrian government does have its own civil defense body, specialized in disaster and disaster relief (Active in almost all the territory) and strongly depauperada by the economic blockade product of the sanctions. Similarly, it displaces, hegemonizes and criminalizes the action of other truly humanitarian groups, including the Red Crescent and the International Red Cross, as it also campaigns against the same action by the United Nations on this field of action. A global power that tries to impose itself on local, national. In summary, scenarios of situations oriented to the Western public, seeking to convey the idea of genuine and legitimate the process of intervention via false flag operations, promoters of disinformation via disaster propaganda, transmitters of the idea of neutrality to be beyond politics. It is evident everything that could be claimed in contextual jumps, since in operational “phases”, the insurrectional operation in Venezuela is not at the tragic and violent point (and in resistance) in the case of the Syrian Arab Republic . But the precedent, the model, remains. Situations planned in larval stage? Finally, as Mission Truth has developed, the panorama of the Venezuelan information battlefield has experienced a dramatic jump in strategies, tactics and methods to produce (dis) information about what happens on the ground, where the battle is Matter, entails, and is intended to climb the same dangerous path. How much prefiguration and projection into the future have these kinds of operations as here analyzed? To what extent will the procedures that control the narrative be extended in both sphere 2.0, the news, and on the administration of the territory as a privileged scenery? We already saw a test balloon and its results with the incident of April 10 in Las Mercedes. 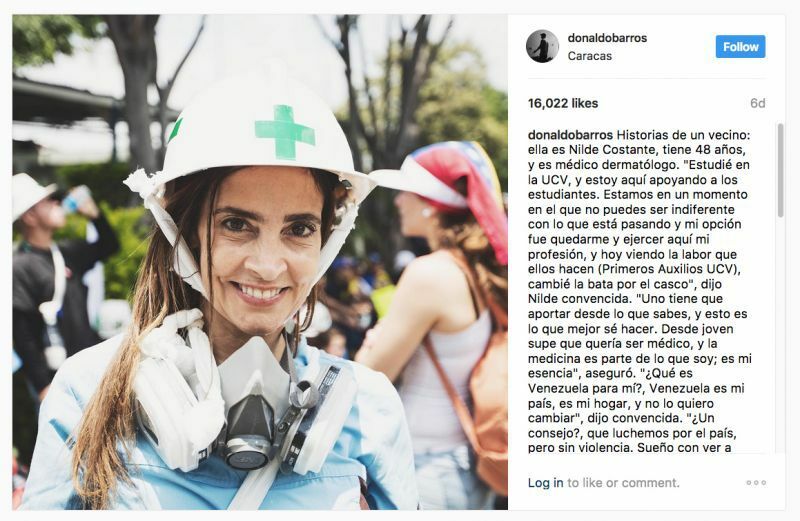 In recent days, again from his Instagram account, First Aid UCV denounced the treatment that a journalist of Venezolana de Televisión granted them, disregarding any agenda , any war context and appealing to international legislation to certify their selfless work. If so, they should then also consider all the positive, promotional and exacerbated propaganda that the media clearly added to the coup plot are developing at this time, since it would do the same poor favor.